For the 2014 Beijing Auto Show, Jeep designers combined the legendary capability of the Jeep Wrangler with a touch of sophistication - and a sense of fashion - to create the Jeep Wrangler Sundancer. The design concept is painted a tri-coat Chocolate Brown metallic color with gold accents. The fender flares feature a unique Golden Bronze tone-on-tone ghosted pattern, and the windows also have bronze tinted glass. The unique front and rear bumpers are equipped with linear LED lighting and have been painted a tri-coat Chocolate Brown metallic color coupled with Golden Bronze accent inserts to match the exterior. 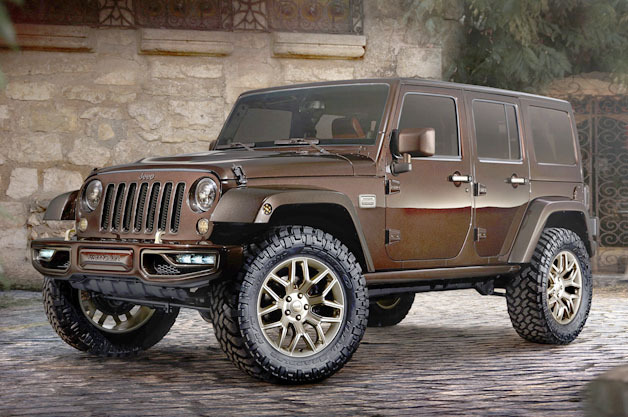 Completing the Jeep Wrangler Sundancer's impactful exterior appearance are 20-inch pale gold billet aluminum wheels with polished gold inserts, and a unique multi-piece billet aluminum fender badge. The Wrangler Sundancer's interior features Axis II perforated seat inserts and exclusive Berry Baltique Semi-Aniline leather, the same leather found in the most luxurious labels in fashion. The door panels and upper instrument panel are wrapped in premium leather and hand sewn provocateur lace stitching can be found on the outer deck seam, steering wheel and center lid console. The gold color scheme from the exterior continues into the interior, with new 'Gold Rush' interior paint on the door handles, steering wheel bezel, grab handle, gear shifter trim ring bezels and sill plates. Finishing touches to the interior include Romina premium leather trimmed/wrapped floor mats. The Jeep Wrangler lineup in China currently includes the Sport, Sahara and the Rubicon model on which the Jeep Wrangler Sundancer design concept is based. Jeep Wranglers in China are fitted with 3.6L V-6 Pentastar petrol engines, or 3.0L V-6 Pentastar petrol engines.